Rags to be made into paper are first sorted, and any unsuitable ones are discarded. Seams are opened, and nonfabric materials, such as buttons, are removed. The rags are chopped into small pieces and then cleaned by boiling them in strong cleansing solutions. Next, they are rinsed and beaten while damp until all of the threads have disintegrated and the fibers float freely in water. This is the paper pulp. The very dilute pulp is next sent to the vat where the paper will actually be made. A rectangular mold containing wires running at right angles to each other is used to make a film of the pulp. Traditional molds have thin, closely spaced parallel wires running across the mold at the surface. These are attached to thick, widely spaced wires beneath them that run in the opposite direction. Paper formed on this type of mold typically reveals a ladder-like pattern when held up to the light, and is known as laid paper. Woven paper is formed on a mold of plain, woven wire screening. Thin wire forming a design may be attached to the mold’s surface wires to produce a watermark in the finished paper. A rectangular frame, called the deckle, is placed over the mold to convert the mold into a sort of tray. This process continues until a stack of alternating wet paper and felt has built up. The stack is placed in a press to eliminate any residual water. Then the paper and felt are separated, and the paper is pressed by itself and hung up to dry. When dry, the paper sheets are dipped in a tub containing size (essentially gelatin or very dilute glue) and dried again. This gives the paper a harder and less absorbent finish than it would otherwise have had. All paper was made by hand until the early nineteenth century. Artists use most of the handmade paper consumed today, though hand printers can still be found who believe it the finest printing surface available. 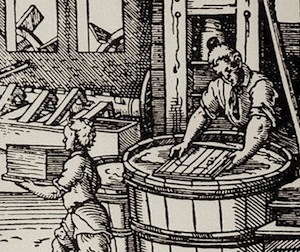 Hardly any paper for book printing is made from rags today. Wood now is the main ingredient of paper pulp, though the better papers contain cotton fiber, and the best are made entirely of cotton. The fibers are converted into pulp by chemical and/or mechanical means. Chemical pulp starts with logs that have had their bark peeled off and that have been reduced to chips. The wood chips are boiled in strong caustic solutions that dissolve away parts of the wood that are not cellulose, such as lignin and resin, and leave the cellulose fibers more or less free. There are two chief processes for producing chemical pulp: the kraft process, and the sulfite process. The kraft process uses the wood of either deciduous (e.g., poplar) or coniferous trees (e.g., spruce, fir, and hemlock) and produces a very strong paper. The sulfite process is less widely used and employs only coniferous wood and an acid solution in paper manufacture. Mechanical pulp is mostly made by stone-grinding peeled logs in a stream of water so that the wood is broken up into fibers. Spruce, balsam, and hemlock are the woods considered best suited for pulping by this process. The ground wood contains all of the constituents of the original wood, including those that would have been eliminated as impurities in chemical pulp manufacturing. Mechanical pulp is mainly used for newsprint because paper made from mechanical pulp quickly discolors and becomes brittle. It also tends to be weak. A superior, stronger form of mechanical pulp is called thermomechanical pulp. It is made from wood chips treated by steam under high pressure. Mechanical pulp is sometimes added to chemical pulp for making low cost book papers. A paper containing no mechanical pulp is called a free sheet. Before the pulp can be made into paper, it is necessary to mechanically beat or refine it. It is also usually bleached with chlorine and calcium hypochlorite. Unbleached kraft pulp is used for grocery bags and heavy wrapping paper. Other materials may also be added to the pulp depending on the type of paper to be made. For book paper, fillers such as white clay and titanium oxide may be added to provide opaqueness and extra whiteness. Size may be added for stiffness and smoothness. Dyes are added for tinted papers. The specific combination of pulp and additives used to produce a particular type of paper is called the furnish for that paper. With better grades of paper, care is taken to produce a furnish that is chemically neutral (pH 7 on the acid-base scale). For a paper to have long life, it must be acid-free. The machine that converts the pulp into paper is called a fourdrinier machine, after Henry and Sealy Fourdrinier who financed its development in England in the early 1800s. The fourdrinier machine takes pulp that is still 99% water and converts it into a continuous web of paper containing only a small amount of moisture. Pulp is continuously fed into the fourdrinier machine on the surface of a moving endless belt of fine mesh screening, usually made of nylon. Deckle straps prevent the liquid pulp from slopping over the sides. The screening is shaken from side to side as it moves forward to help drain the water. Suction boxes below the screening pull more water through, as a wire-mesh-covered cylinder presses on the web of pulp from above. The cylinder may be covered with a plain wire cloth to impart a wove effect, or with wire in a ladder pattern to produce a laid effect. To produce a watermark, the paper-maker attaches a wire design to the cylinder. The now very soggy paper is placed on an endless belt of wool felt that carries it between a series of rollers that squeeze more water from it. It then passes over a series of very large, steam-heated, cast-iron drums that complete the drying process. During drying, the web is held tightly against the hot drums by endless belts of fabric. After the paper has dried, it is usually run through a series of highly polished metal (calendar) rollers that further compact it and smooth its surface. The calendar rolls are arranged in pairs; each pair rolls at a different speed; this effectively polishes the paper. A variety of calendared finishes can be obtained, ranging from antique (softest and dullest), through eggshell, vellum, machine finish, to English finish (hardest and shiniest available without further treatment). Further treatment may include supercalendaring, surface sizing, or coating. Supercalendaring is a polishing process similar to the calendaring process but done on a separate machine. The final finish of coated papers are brushed or rolled on in liquid form. The finish may be matte or glossy. Most papers include size in the furnish, but additional sizing may be added to the surface by running the paper through a vat of sizing material to provide a harder finish after the paper is made. The paper may be coated with fine clay. The clay is adhered to the surface of the paper with adhesives. The paper is then supercalendared with extremely smooth rollers. Dull coated papers are made with clays that finish dull, and are less calendared. Other papers are gloss coated. Papers may be coated on one or both sides. Machine-made paper has a pronounced grain, as evidenced by its tendency to tear and fold preferentially in one direction. This is because the cellulose fibers tend to align themselves in the direction of travel as the pulp is laid down on the wire. Shaking does not completely achieve random alignment. In reeled paper, the grain always runs lengthwise. In sheet paper, the grain may run either the long way or the short way, depending on how it was cut from the reel. Like most fabrics, paper has a right and wrong side. The bottom of the web (called the wire side) next to the screening at the wet end of the fourdrinier machine is slightly rougher than the top (or felt) side. If only one side of the paper is to be used, the smoother side is usually chosen. Paper made on a twin-wire fourdrinier machine has either two felt sides or two wire sides; this is because two webs of pulp are laid down simultaneously and pressed together as the paper is dried and finished. One-sided paper is more expensive than ordinary two-sided paper. I’ve been able to use some really high end moulds – numbered with laid surfaces and ribs and sewing and brass corners and they were a dream to cast with. It’s not just hype. Yes, you can stretch fiberglass screen across a plastic embroidery hoop — and my 10″ circular paper for the treewhispers project was best accomplished this way. If you are ever making more than 3 piece of paper at a time, you will want a better mould and a good deckle— a surface that won’t sag, a surface that drains evenly , a structures that stays out of the way of sheet formation. I love the look and feel of the 40 mesh brass I found at a great price from http://www.buymesh.com but now that I’ve found a comparatively low cost source — which mesh is best? I bought 40 mesh mimicking what I read that LSM has in their custom moulds. It was $5 a foot. (vs. $18 a foot from the papermaking house). And I also obtained 8 by 8 brass backing wire, but not much as I wasn’t sure that was the way to go…. But why 40 vs 30 or 60 or 80 mesh? And for backing wire how dense or spread should that be? Could I mix metals– put aluminum backing behind my fine brass top screen are there potential reactions? And in terms of metals– what are the advantages to stainless steel vs brass vs aluminum? The woods I have read about being used for the good moulds are: Mahogany, kiln dried White Oak, Douglas Fir, Ponderosa Pine for ribs, Baltic Birch plywood. Though one would think the fruit woods, as they use in glass blowing, would be best. The fruit woods are used for the shaping/forming tools because they withstand the wet/heat/steam the best… so kind of surprised that I don’t see them mentioned in the paper catalogs. So I’m thinking about a hybrid–aluminum dowels, the appropriate wood , 40 mesh brass top surface and 8 by 8 mesh brass for the backing if I can find it for less than $35.73 per square foot. Though I just ran across another model (Twinrockers) for a 22″ by 30″…. the mould is made by 1 by 2 with a 1/4″ by 1″ and 1-1/8″ lath, non rusting drywall screws hold it together, and plastic egg crate is placed in the mold instead of ribs on top of which two layers of different mesh aluminum cloth is placed and stapled and then sewn. I would have bought aluminum, but it cost more than the 40 mesh brass (which is superior in this application). But the heavy gauge brass — the 8 by 8 brass is $36/ft or 6 by 6 polyester is $31/ft. I am attempting to create other moulds using ballusters– the silk screening boards/frames. I bought an arrow t-50 staple gun and have stainless steel staples. I have rubbed linseed oil on them to make them water resistant. I’m also in the process of creating a mould from the “best” stretchers (the notched wood boards used to stretch canvases). I’ve rubbed linseed oil into them and will staple my brass mesh and brass support structure to them. I bought paper mill screening from Canada — 41″ by 81″ (was supposed to be 39″ by 78″, but who’s complaining) arrived yesterday–at a cost far less expensive than what I have been able to find so far in the states. Paper is available in a wide variety of weights, colors, textures, and finishes for a multitude of purposes. Book papers are intended for book and journal printing. Almost all bookpapers are surface-sized for offset lithography. The sizing resists penetration by the water and ink used in offset printing. Book papers are mainly made from Kraft pulp, sometimes with machine pulp added. Text papers are available in many colors and textures for use in advertising leaflets, endpapers, etc. They are also sized for offset printing. Cover papers are used for heavier papers, and are chiefly used for covers for pamphlets, journals, and paperback books. Newsprint is made for printing newspapers, advertising catalogs, inexpensive paperbacks, and other items that will probably only be read once if at all, and then thrown away. It is made from machine pulp, usually with some chemical pulp added for strength. Bond is made mainly for office use and ranges in quality from top-grade papers made from 100% rag pulp to low-grade stocks consisting largely of machine pulp.